Winemaker’s Notes: Intense ruby color. Aromas of small black berries (black currant, blackberry), violet, with evolution on the liquorice. Soft attack, with aromas of red fruits. The backbone of the wine is its minerality. The finish is long and spicy. My Review: Man, am I overdue to be writing about this one. Work-life often seems to get in the way of wine writing-life. Oh well. Guess the only thing to do is drink more wine and write about it. Such a first world problem. 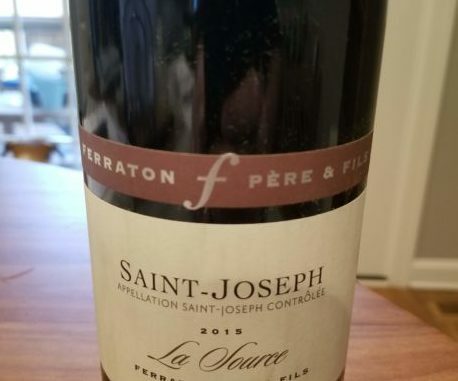 But enough about my struggles to sit down and write, let’s talk about some wine, specifically the 2015 Ferraton Pere & Fils Saint-Joseph “La Source”. In the glass the wine was a deep red for me, and on the nose I picked up aromas of dark berries and spice. In the mouth the wine was dry, with flavors of blackberry and currants on the front, with spice and minerality coming into play at the finish, with just a touch of smokiness/meatiness (and dare I say….bacon?) showing up as the wine opened up. My wife and I paired the wine with ribeyes, potatoes, and asparagus, and I have to say, it was an excellent pairing. The wine was a nice balance to the umami flavors of the compound butter I used (a black truffle butter, in case you were wondering), and the dryness of the wine balanced the juiciness of the steak. I really enjoyed this wine. I don’t drink a ton of single-varietal Syrah; not because I don’t tend to like it, but because I often have a hard time finding it at stores without going to my nicer wine shops (which I don’t do as often as I should). At $32 I thought it was a great value – perfect for opening for a nice dinner, but at a price point you can pick up a few bottles to share with friends that will appreciate the wine. As we enter into Spring and Summer (FINALLY! ), I suspect a few bottles like this are going to be good for having around as my grill sees more and more use.